Observe the process from shearing the sheep to working the wool and making the shawl during the springtime event at the Littleton Museum on Saturday, April 17th. Free special program events are scheduled from 10am-3pm around the 1860s Farm at the museum. The museum complex includes two living history farms depicting earlier times in the Littleton area – one in the 1860s and one in the 1890s. 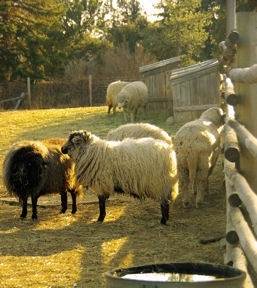 Animals breeds at the farms are authentic to those early settlers would have raised on local farms. 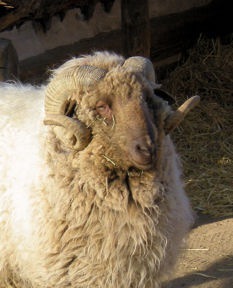 Wool from the Churro sheep is especially popular with weavers. 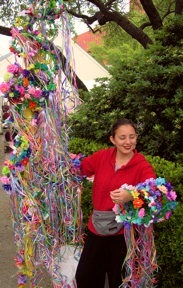 Demonstrations on Saturday will include shearing, washing, carding, spinning and weaving. Also currently on exhibit at the museum is a collection of 19th century Rio Grande weavings on loan from the Albuquerque Museum. “Wonders of the Weavers, Marvelas de los tejedores,” runs through June 27, 2010. When You Go: Littleton Museum, 6028 S. Gallup Street, Littleton, CO is open Tuesday – Friday 8am-5pm, Saturday 10am-5pm and Sunday 1-5pm. Closed Mondays and Holidays. FREE. With tax season at a close San Antonio prepares for the biggest party of the year. 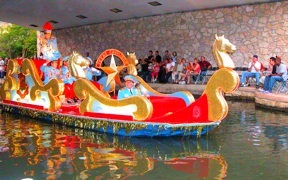 Truly a citywide celebration, Fiesta San Antonio begins today. More than a hundred scheduled events continue through April 25, 2010. 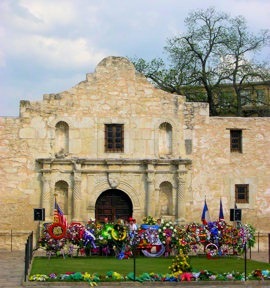 The tradition reaches back 119 years when citizens decided to honor the heroes of the Alamo and the Battle of San Jacinto. Horse-drawn carriages, bicycles decorated with fresh flowers and floats carrying children dressed as flowers comprised the first parade. At the 1891 parade half the participants went one direction, the other half headed the opposite way pelting each other with blossoms as they passed – thus the name, the Battle of Flowers Parade. The 2010 version steps off down Broadway on Friday, April 23. 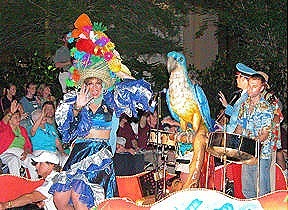 Additional parades have been added over the years including the popular Texas Cavaliers River Parade and Fiesta Flambeau Night Parade. The Fiesta Military Parade takes place on the parade grounds at Lackland Air Force Base April 21st. The King William Historic District sponsors a fair and parade; even canines get in the act with an official Fiesta Pooch Parade. Every single official 2010 Fiesta event is sponsored by a local nonprofit group or military organization. Arts, performances, feasts, sports, music and balls attract more than 3 mill ion attendees during the eleven days. Many Fiesta events honor Texas’ rich history and heritage. One of the most solemn is the Pilgrimage to the Alamo (April 19. 2010). In tribute to the Alamo heroes a procession of historic, civic, patriotic, military and school groups walk in silence from the Municipal Auditorium to the Alamo. As each group places a floral wreath on the greensward the names of the Alamo defenders resound from inside the famed walls. The Alamo: These Sacred Walls (April 21, 2010), presented by a living historian dressed in period attire, tells the story of historical events leading up to the Alamo siege, the siege itself and its aftermath. 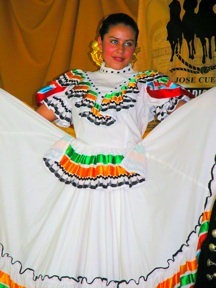 Much more festive is A Day in Old Mexico & Charreada (April 18 and 25, 2010). 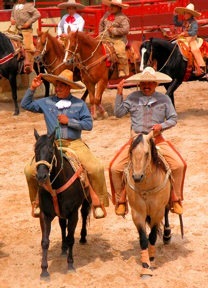 This event carries on the tradition of Charreria which originated in 19th century Mexico as a way for the gentry to prepare horses and riders for war. Over time Charreria evolved into an equestrian competition featuring horse reining, bull riding and roping skills. 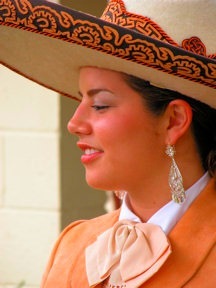 Today’s charros (traditional horsemen or cowboys) wear the traditional clothes and use horse equipment as required by the Federation of Charros in Mexico. 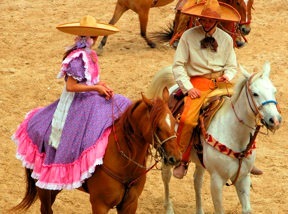 Young women demonstrate their riding skills in the colorful Escaramuza; six or twelve member teams execute precision movements while riding sidesaddle and wearing ranchera dresses. In addition to the Charreada there’s plenty of mariachi music, Mexican ballet folklorico, food and drink. 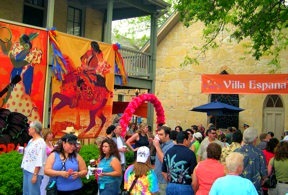 A Night In Old San Antonio – NIOSA – attracts a huge gathering to La Villita Historic District four nights during Fiesta (April 20-23, 20 10). 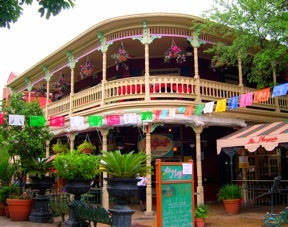 Friends and strangers meet and feast in the 18th-century Spanish neighborhood in the heart of downtown San Antonio. More than 250 food booths arranged in 15 ethnic areas serve up everything from Armadillo eggs (jalapeno peppers stuffed with cheddar cheese and baked in a biscuit-batter) to ZiegenBock beer. Entertainers on a dozen stages provide music for noshing and partying – polka at Sauerkraut Bend, country & western at Frontier Town, The Sabas Trio at Villa Espana. When we visited San Antonio during Fiesta San Antonio, we loved all the events we could cram into four days, from morning to late night. I can’t quite imagine keeping up the pace for all 11 days – but, it might be fun to try. If you’ve ever enjoyed time in San Antonio or haven’t yet visited this unique city, I suggest putting a late April visit on your destination list. Whether it’s the Sticky Wicket Croquet Tournament, Pinatas in the Barrio or Miss Margaret’s Victorian House Tour there’s a Fiesta event to match your interest. And remember, all the proceeds support one of the sponsoring non-profit organizations – join in as San Antonio parties with a purpose. 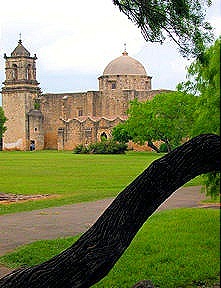 Although not one of the official Fiesta events one of my favorite San Antonio experiences is the Sunday Mariachi Mass at Mission San Jose, one of the churches comprising San Antonio Missions National Historical Park. The church at Mission San Jose is an active parish with a full mass schedule. 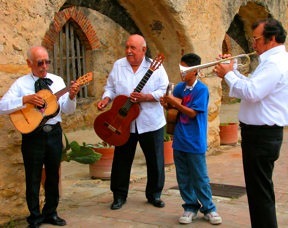 The Sunday12:30pm mass is a bilingual/mariachi worship attended by parishioners and tourists. The welcome is warm but it’s advisable to arrive early since the church frequently fills to capacity. Please dress and behave appropriately. Barrels are tapped and last fall’s harvest sipped and swirled during the annual “Barrel Into Spring” weekends at wineries around Grand Junction, Colorado. 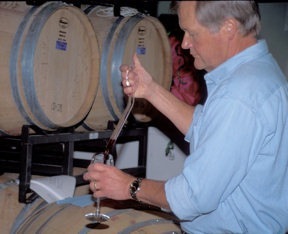 Eight members of the Grand Valley Winery Association host visitors two weekends each spring, April 24-25 and May 15-16 in 2010. Each winery pours current releases as well as the first tastings of the 2009 vintages – a sneak-peak into their potential. Tickets for each weekend – good for Saturday and Sunday of the same weekend – are limited so this is not an overly crowded shoulder to shoulder experience. A commemorative wine glass, passport and map awaits ticket holders at their assigned first winery. After that everyone is on own. You’ll welcome to spend as much or as little time at each venue as you choose. It would be a real rush but I’ve met people who have visited all eight in one day. Cyclists set a more leisurely pace pedaling along the rural roads between wineries. 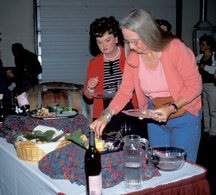 Food, the perfect wine companion is not overlooked during the tastings. Each winery features dishes to showcase their wines. At one it may be an Italian deli-like spread, at another a German theme built around their Gewurztraminer. From cheese to chocolate tasters learn great pairing tips. You may even go home with a couple of new recipes. Depending on your interest the weekend offers a great opportunity to increase one’s wine knowledge. A presentation or tour is offered at eac h location. 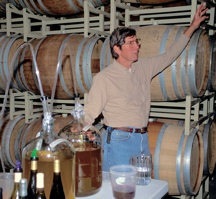 Bennett Price of DeBeque Canyon Winery may share his years of experience demonstrating the wine-making process with carboys, tubing and airlocks. 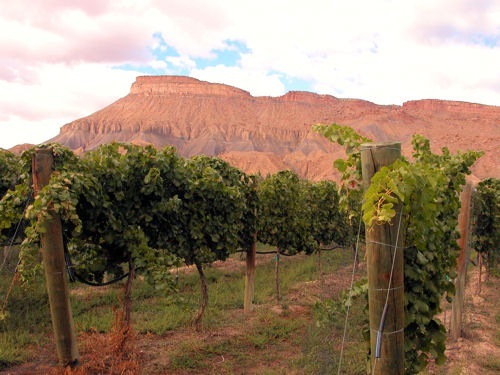 At Canyon Wind Cellars you can tour Colorado’s only underground wine cellars. Experience the difference that varietal blending makes, or sample the flavors imparted by oak barrels from America verses France. Leave with a greater understanding of terroir and viniculture. Spring barrel tasting weekends seem well designed for both the casual sipper and the connoisseur stocking their private collection. The participating wineries offer a 15% discount on wines purchased by event ticket holders. You’ll see those intently taking notes of each tasting while others are simply enjoying a casual weekend getaway. Grand Junction and the Grand Valley region of Western Colorado offer numerous outstanding options for getaways. From the sandstone formations of Colorado National Monument to the Gateway Colorado Auto Museum, whitewater rafting on the Colorado River to the serenity of fly fishing on Grand Mesa, fruits direct from the orchard or fine dining you’ll want to return again and again. When You Go: Barrel Into Spring tickets for the May weekend are $60 if purchased before April 19th. Tickets for the April weekend are $65. The event usually sells out, don’t go without making reservations. Lodging, dining and activity information available at the Grand Junction Visitor and Convention Bureau. 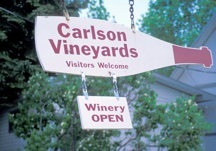 The participating wineries all have tasting rooms regularly open to the public. Stop by the Grand Junction VCB at 740 Horizon Drive to pick up a free map to Colorado’s Wine Country and tour any time of year. 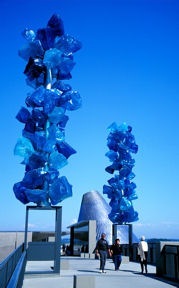 The east end of the Chihuly Bridge of Glass deposits us on the rooftop plaza of the Museum of Glass. Several temporary outdoor exhibits join the permanent Water Forest by Howard Ben Tré along the terraces and reflecting pools. On clear days – yes, you can experience a bright, blue sunny day in Tacoma – Mt. Rainier rises over the city in glaciated splendor. Clad in stainless steel, a distinctive 90-foot tilted cone symbolizes the city’s transformation from industrial to cultural center. Architects took inspiration from the wood burners found at sawmills when the regional economy prospered from lumbering. A grand staircase wraps down the cone to the museum entrance. The cone houses the core of the museum’s commitment to glass – The Hot Shop Amphitheater. 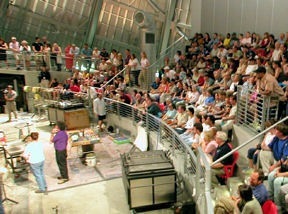 Tiered seating accommodates 200 visitors while teams of artists experiment, demonstrate and create with molten glass in this arena for art. Cameras transmit live video to large screens providing up-close viewing of the process while a narrator explains terminology, materials and techniques, and answers questions from the entranced audienc e. Not in Tacoma? Watch the Hot Shop in operation live via web streaming. When entering the working studio we note the heat and roar of gas furnaces where batch glass is melted to temperatures over 2,000 degrees Fahrenheit. 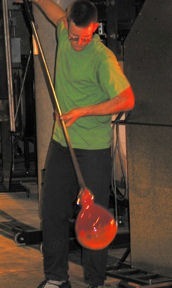 A team member gathers molten glass on the end of a blowpipe. With the first breath of air we see the magical beginnings of an art form dating from the time of Christ. As the objects are shaped and blown they require reheating in the glory hole to keep the piece malleable. Other team members prepare colors and additional molten materials. The artist keeps the pipe in perpetual turns using and resisting the powers of gravity and centrifugal force. The narrator tells us that the artists we’re seeing come from Rhode Island, the Midwest and California, each with 8-10 years of experience. 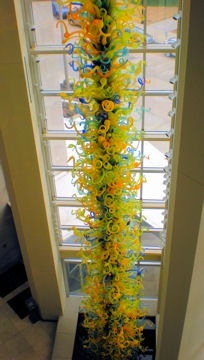 Some observers stay for 15 minutes while others spend hours watching the intricate choreography and teamwork as a fine glass sculpture evolves. Differing perspectives and viewing angles intrigue as we circle the Hot Shop on the elevated walkway – stopping often to observe the action below. The museum dedicates exhibition space to contemporary art in all medias. In the Education Studio guest artists lead visitors in interactive, experience-based learning activities. Daily docent-led tours focus on either the current gallery exhibit or the architectural structure and outdoor installations. We pause our museum tour for a restful lunch in Gallucci’s Glass Café overlooking the water. 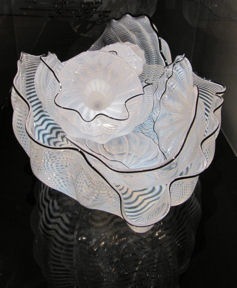 Before leaving we make sure to browse the Museum Store where we find glass art made in the Hot Shop as well as pieces from an array of contemporary artists, a broad selection of books, jewelry and gift items. 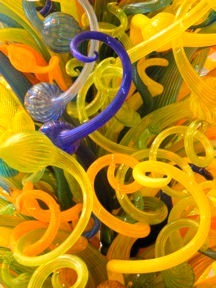 The west end of the Chihuly Bridge of Glass leads to additional cultural attractions and city center. 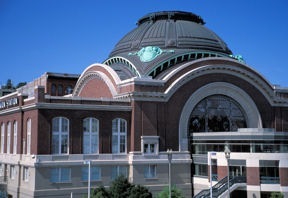 The Washington State History Museum relates man’s encounters and influences through multi-media presentations. No dusty shelves of relics here. From early Native Americans and sea explorers to the aviation industry the story of the Pacific Northwest unfolds. We return twice during our stay to this innovative facility to tour the quality permanent and temporary exhibits. 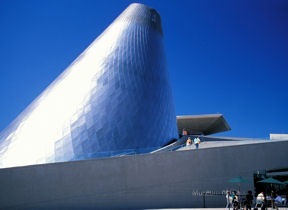 The Tacoma Art Museum completes the museum triangle. Collections include European Impressionism, Japanese woodblock prints, American graphic art and Northwest Art. 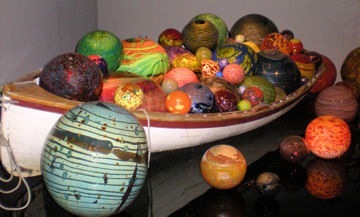 Not surprisingly, the museum holds a large public collection of Chihuly Glass representing major series of his works from 1977 to present. An added bonus to the museum triangle is the former Union Station now serving as a Federal Courthouse. The restored Romanesque building features a six-story rotunda – a perfect gallery for Chihuly artwork. A 1,000-piece chandelier hangs under the central dome and a massive arched window is adorned with 27 monumental sized glass creations Chihuly named the Monarch Window. I used to considered Tacoma the half-sister to Seattle but after spending several days and exploring the museum triangle we found her a worthy sibling rival. When You Go: The Tacoma Regional Convention and Visitor Bureau is a helpful resource in planning your Tacoma and surrounding Pierce County visit. April 12 – Art and Jazz – Colorado Style! – Champagne reception, the Jazz Connection and paintings from the First Lady’s Plein Air Art Show and Auction. May 10 – Rekha Ohal – Rekha’s popular whimsical music played on the 1914 Steinway piano in the Mansion’s Drawing Room and reception in the Palm Room. October 11 – In the Buff – The University of Colorado’s all male a cappella choir shares harmony and their unique style; plus, the Autumn Garden Reception. November 8 – Program to be announced. 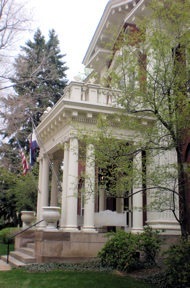 December 13 – Rocky Mountain Ringers – Ring in the season at the Mansion beautifully decorated for the season, reception with holiday treats and music by the Rocky Mountain Ringers. Admission is $20 prior to the event and $25 at the door. Registration is required; cindy@grpfund.org or by phone at 303-837-8350, option 4. Light streams through thousands of handcrafted glass objects resembling purple sea urchins, red reeds, and ruffled clamshells. We stand beneath a 50-foot ceiling along a portion of the pedestrian Chihuly Bridge of Glass which spans Interstate 705 in Tacoma, Washington. The longer we observe the art forms inspired by the sea the more details surface to our appreciative eyes. 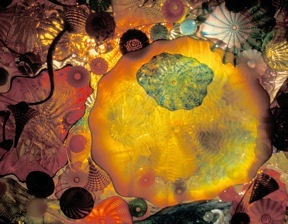 The unique bridge and public art showcase features the creations of world-renown glass artist Dale Chihuly, a Tacoma native son. 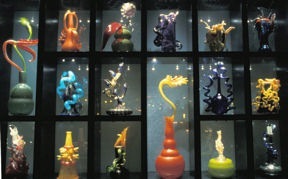 More than 200 museums hold collections of Chihuly pieces. 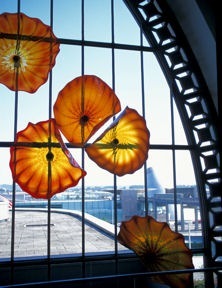 Here, three distinctive installations reflect the creative leaps Chihuly has introduced to glass art and sculpture. 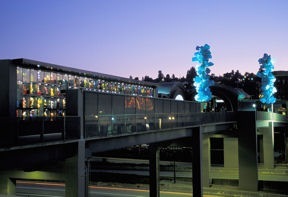 Dedicated in July, 2002, the 500-foot-long bridge links downtown Tacoma with the Thea Foss Waterway and the Museum of Glass. Below the structure, railroad tracks and the interstate spur run into the city. Those walking across the span encounter the glass ceiling of the Seaform Pavilion, two ice blue Cry stal Towers jutting skyward, and the Venetian Wall displaying 109 Chihuly sculptures. With traffic zipping underfoot visitors pause to view and photograph. Someone points to a buttery yellow form almost three-feet in diameter and comments on the undulating rim. Soon, complete strangers join in a show-and-tell of favorite colors, shapes and overlays. Ardent admirers assume a prone position on the walkway, gazing upward. The flow of glass and color seems to pulsate – reminiscent of a gentle tide on a sandy beach. A slightly different angle produces an iridescence similar to an abalone’s inner shell. 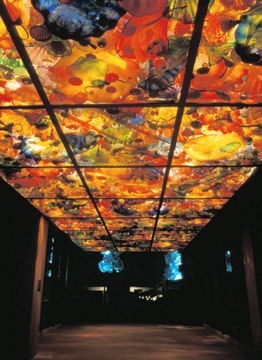 The ceiling incorporates 2,364 individual glass pieces. Each of the glacial blue Crystal Towers standing 40 feet above the bridge deck are made of 63 large hollow Polyvitro crystals, not glass. 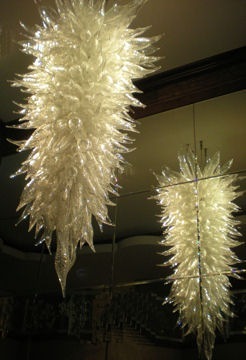 Chihuly comments, “As with glass, it is really light that makes the Polyvitro crystals come alive." Putti – popular 16th & 17th century European art figures representing Cupid – the Roman god of love. 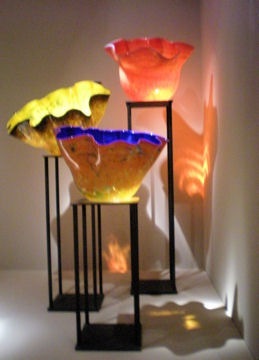 Chihuly places his unique Putti atop classical vases. As fascinating as the pieces are in natural daylight they become ever more dramatic under fiber-optic illumination at night. After dark illuminated colors intensify in contrast to night skies and pieces glow from reflecting headlights. 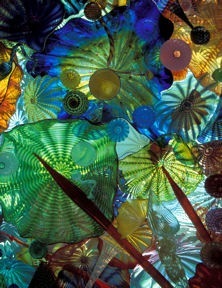 Day or night strolling the Chihuly Bridge of Glass is the most artful way you’ve crossed an Interstate highway. 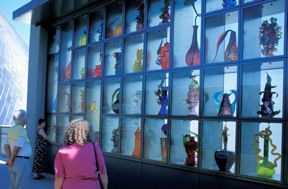 When You Go: The Chihuly Bridge of Glass is open 24 hours a day. 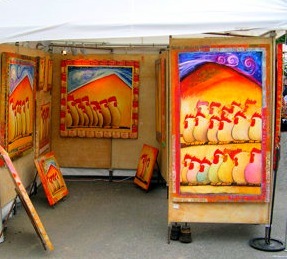 A spectacular free display of original art in public places.